iran-hrm – The Iranian Judiciary issued prison sentence from 6 months to 12 months for five young women for participating in protests last August, reports from Iran say. 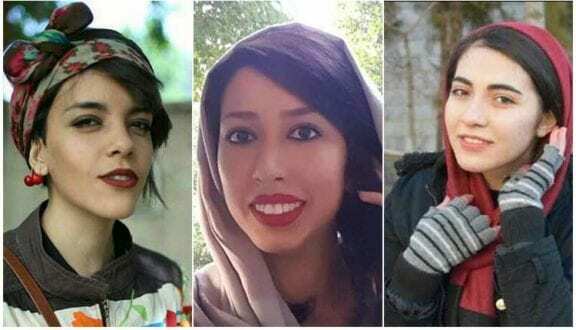 Yasaman Ariani, 23, and Saba Kordafshani, 19, and, Azar Heydari have been sentenced to one year behind bars while Mozhdeh Rajabi and Niloufar Homafar were sentenced to six months. Yasamin Ariani and Saba Kord Afshari were lingering in limbo in Qarchak Prison in Varamin since the time of their arrest on August 2, 2018. They have been transferred from Qarchak to Tehran’s notorious Evin Prison after their sentences were issued. Yasamin Ariani was arrested after helping an old woman who was thrown to the ground by anti-riot units. Yasamin Ariani’s mother said her daughter had gotten arrested 75 days ago outside the City Theatre in Tehran while she was trying to help a lady brutalized by the police. The families of the arrested protesters held a protest outside the Revolutionary Court on Tuesday, October 16, 2018, demanding release of their children. Thousands of enraged protesters poured into the streets of several Iranian cities for several days in early August, protesting the country’s faltering economy, skyrocketing inflation, hardship and hiking prices. Reportedly, dozens of protesters were arrested and taken to Evin and Qarchak prisons. Videos and images shared on social media show the Regime’s anti-riot units using horrific violence against the mainly young protesters. On August 8, Amnesty International called for the immediate and unconditional release of all detainees, as well as an “impartial and independent” investigation into the suspicious death of Reza Otadi, 26, who was killed during the same protests in Karaj.